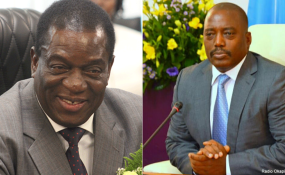 Stability, Democracy on the Cards for DR Congo and Zimbabwe? Some 280 billion FCFA was recently raised in Geneva for emergency aid in the country. The government of the Democratic Republic of Congo, DRC, has warned of serious consequences if it does not have a say in the management of 528 million US dollars (280 billion FCFA) raised by the UN at a donor conference in Geneva, Switzerland on April 13, 2018 for emergency assistance in the country. "Money has been raised. The DRC government must now be involved in its management. If not, there will be serious consequences," "Le Potentiel" newspaper cited Foreign Minister Léonard She Okitundu as saying. On its part, government plans to raise 100 million US dollars (53 billion FCFA) for humanitarian assistance in 24 months. Speaking at the donor conference, UN Emergency Relief Coordinator, Mark Lowcock, emphasized government's leadership role in dealing with the crisis. He disclosed that the UN was discussing with Kinshasa to hold a joint follow-up event to the donor conference. The DRC government strongly opposed the holding of the donor conference, discouraged some nations from participating and boycotted it, arguing that the humanitarian situation in the country was grossly exaggerated by the UN. Léonard She Okitundu had threatened charities receiving Belgian funding that they will be barred from working in the country. The position was condemned by the opposition, the Catholic Church and human rights organisations. The special donor conference in Geneva had hoped to raise 1.7 billion US dollars (901.4 billion FCFA) for 13 million victims of violence and displacement. According to the UN, ethnic violence has worsened in eastern DRC, with areas hitherto untouched by armed conflict and disaster experiencing high levels of violence in the past year. Moreover, the political transition in the country is creating tensions. President Joseph Kabila, who is supposed to have left office at the end of 2016, plans to hold elections next December.